Gift cards are a lovely way to give someone a wonderful experience (and wonderful food!) so close to Wichita. They can be used for our five-course farm to table dinners or for breakfast or lunch at Bramble Cafe. They can also be used for blackberries during the season (roughly mid-June to mid-July). They are excellent for birthdays, anniversaries, employee gifts, holiday gifts or teacher gifts. Your card will be mailed within 4-7 days along with one information card for each recipient. $3.00 handling fee. To pick up a gift card or to order multiple cards, call us at 316-305-2984. Need ideas of our prices? *The five-course Farm to Table Dinners are $70 per person plus beverage and tax (hospitality included – no tips accepted). The average dinner for two, including the recommended wine pairing (four 3-oz pours for $25.50), is about $220. *Bramble Cafe items ranged from $3 to $12.00 in the 2018 season. *Blackberries were $10.00 a quart or $38 a flat in the 2018 season. *Blackberry You-Pick: $15-$17 for a 2-quart pail in 2018. Questions? 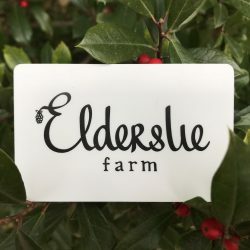 Email us at hello@eldersliefarm.com. If the gift card is being sent directly to a recipient, we're happy to include a short note from you.